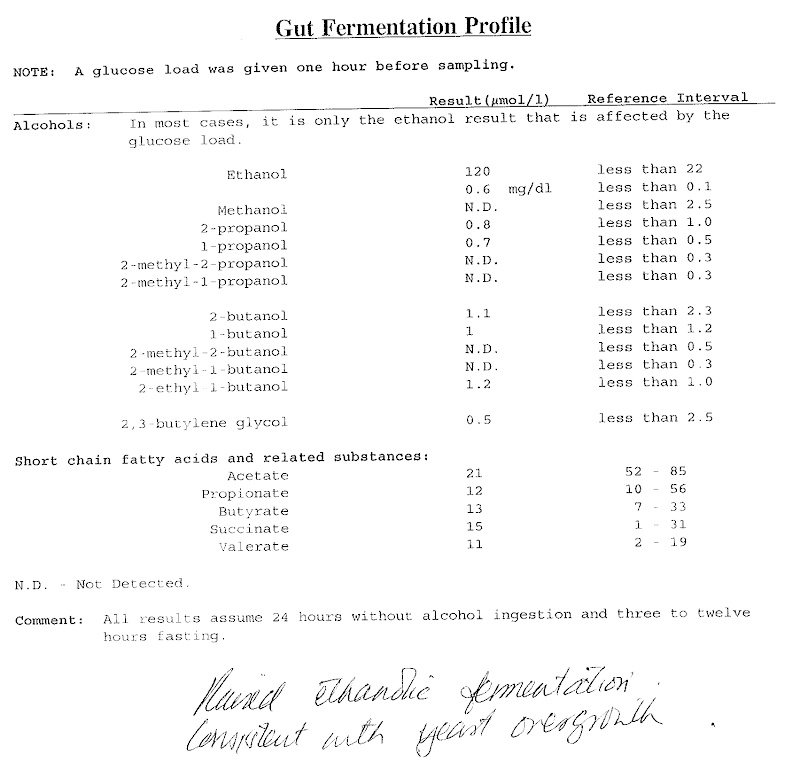 The results of tester 8 in the MeBO-Biolab gut-dysbiosis study have been returned (apart from the gut permeability test result), and once again it shows a fairly high level of ethanol (in relative terms), indicating yeast fermentation in the small intestine. 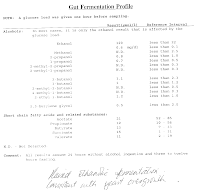 Indicans was also positive, which indicates alteration of tryptophan by gut bacteria, and is a crude and inexpensive test, and can imply a putrefaction action by gut bacteria (A doctor's explanation of the indican urine test). This is the 3rd positive for indicans in our study. Tester 8 is our 3rd tester since vitamin B2 was added to the survey, and once again had a deficiency as the previous 2 had. D-lactate was normal again, with only tester 2 being abnormal (possibly since they were taking probiotics at the time). Again, we cannot say these results prove anything, and are just a limited snapshot of how testing can possibly show best what is going on in people with systemic body odor or halitosis complaints. However, hopefully they are a foundation to work on, in trying to define systemic body odor/halitosis disorders. Anyone wishing to do the study can fill out the MeBO-Biolab body odor/halitosis gut dysbiosis survey and the process will begin. Unfortunately those overseas from the UK seemingly cannot do the vitamin B2 or d-lactate test, since the sample will likely be spoilt in transit. Testers need to pay for their own tests. The results of tester 9 are also back and will be posted soon next week, along with the updated table of all results.